It has been a while since we spent any time updating our web page. For this we apologize. 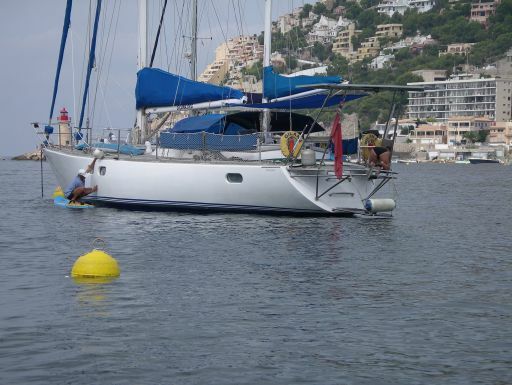 As this website is dedicated to sailing, and more specifically cruising, and there was not much of that happening, we did not want to bore you with the details. 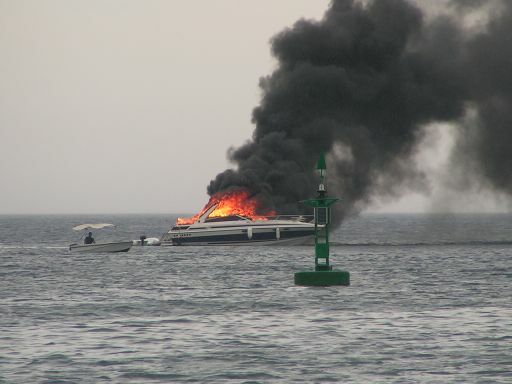 When Liz got her job on motoryacht "A" in 2008, we were in Roatan, Honduras. We felt a need to be in the same time zone as her, probably more for our own good than for hers. We at least wanted to be available for her, so we crossed the Atlantic again and put our plans on hold. 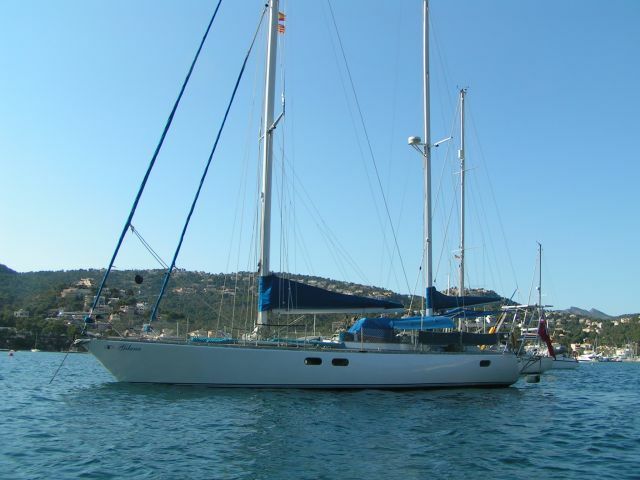 We spent the first winter in Port 'd Andratx, the second in Portocristo, and the third and fourth in Marina de Bonaire, owned by our good friend Leo. We owe him a debt of gratitude for his kindness, and, truth be told, for being a gentleman, friend and all round good guy. The events of the first two years are well covered in their respective sections on this page, including the highlight of it all, Liz's wedding. This page then, is a summary of some of the things we missed, and what we were doing during this time. 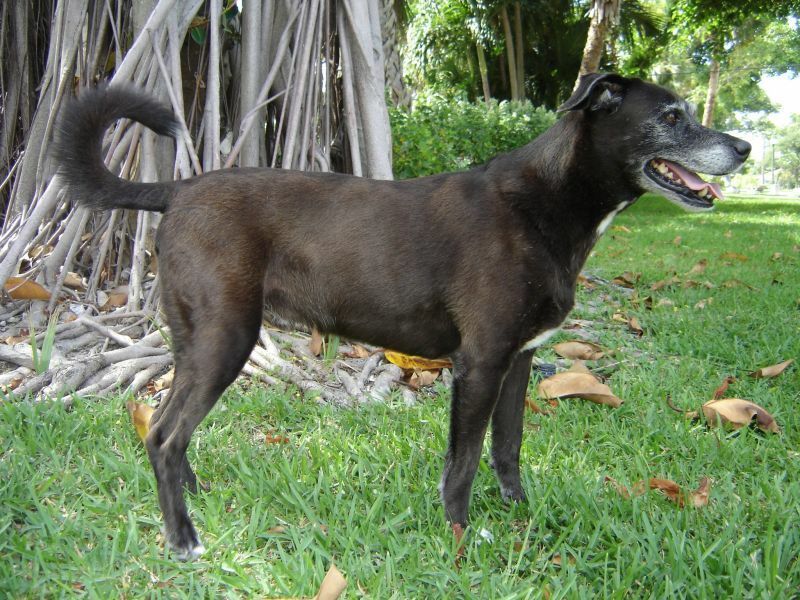 This picture of Jack, taken during happier times in West Palm Beach, Florida, is "In loving memory" of his passing on Friday 13th May 2010. Dang, he was one fine dog, and a wonderful companion. 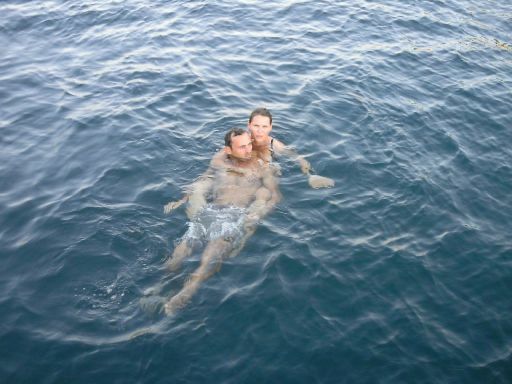 This is the last photo we have of Jack. If you look carefully, you can see the swelling in his right leg, and shoulder. The cancer had spread to his lymph nodes, and the prognosis was not good. Finally we decided to bid him farewell. This is a copy of the email I wrote to James, asking him to break the news to Liz very gently. Jack had a bad day today. He was in pain this morning, and could not walk at all, I carried him to make a weewee, he just stood there after finishing. Every time I picked him up, he yelped. We took him to the vet to see what he could do. He gave us all sorts of things, tablets and an injection to ease the pain. We brought him home and had lunch with him. He watched our every move. He was panting as if under stress, and when we tried to move him he yelped again and again. We made him comfortable, and continued our work, but he was moaning, talking, saying owww. Mom came upstairs from the yard, and we decided it was enough. We both loved him and gave him lots of viennas. 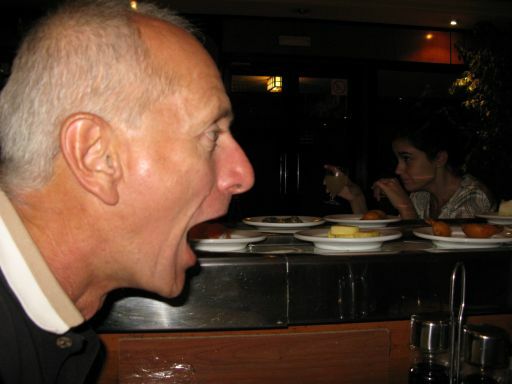 He loved that. Then I picked him up and carried him to the car, and we went back to the vet. This time Gabriel was there. Jack and him get on really well. Gabriel took one look and shook his head. He felt around and said that the cancer had affected his liver, pancreas, and the whole shoulder joint, his right lung was also deflated. We asked Gabriel to prepare the sleeping syringe, and while mom and I held his head between ours, whispering comfort in his ears, he fell asleep. Aside from running and maintaining our dear Gilana, we also got up to lots of other things for friends. 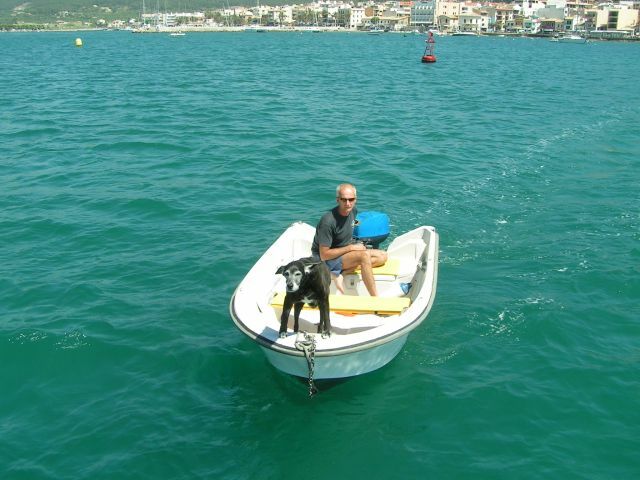 Toni Navarro and I have been friends since 2003 when we met due to some Yamaha outboard motor discussions. We immediately got along and laughed a lot together. After we returned in 2008, his business was growing and I did a web page for him. Take a look at it if you like, simply click the picture above. 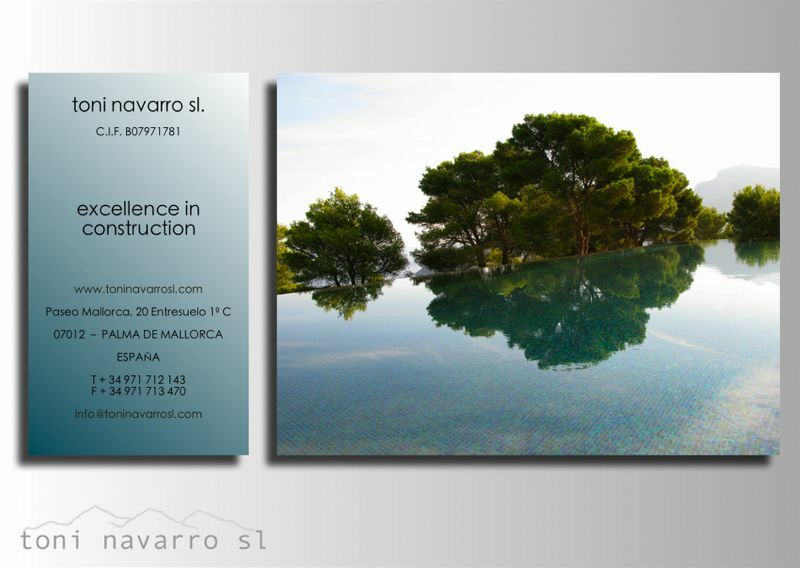 As I write, his company is one of the most sought after and successful construction companies in Mallorca, and he remains totally unaffected by the economic climate and the downturn in the construction sector, no wonder, his delivery of the finished product is perfect and very sought after. There is now a waiting list just to get him to quote on new work. We only haul Gilana about every six years. 2011 it was her turn again. 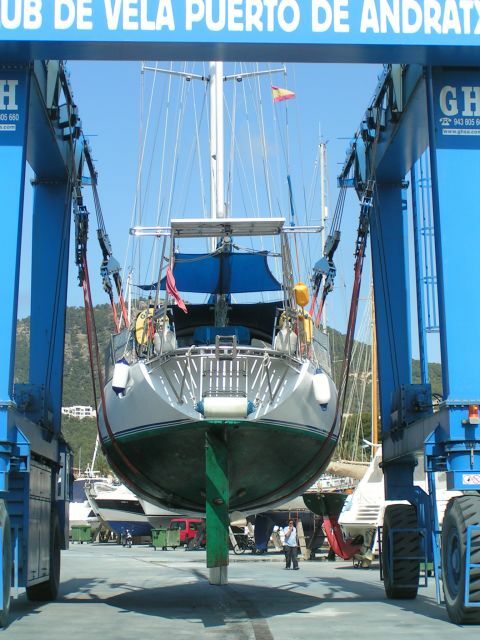 Here we are slung at Club de Vela Port 'd Andratx. 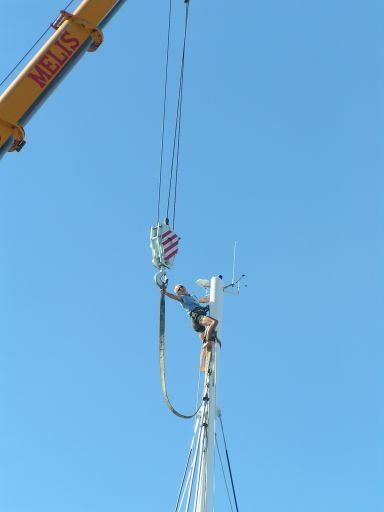 A major job this time was to renew some plating and connections in the holding tank. 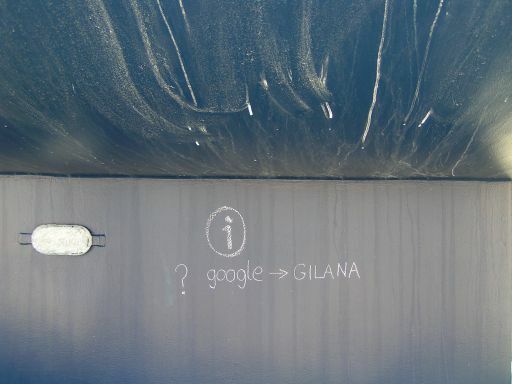 Gilana is designed that all tanks form a double bottom. Here I do some upside down welding putting in the new plate complete with its inlet and outlet pipes. 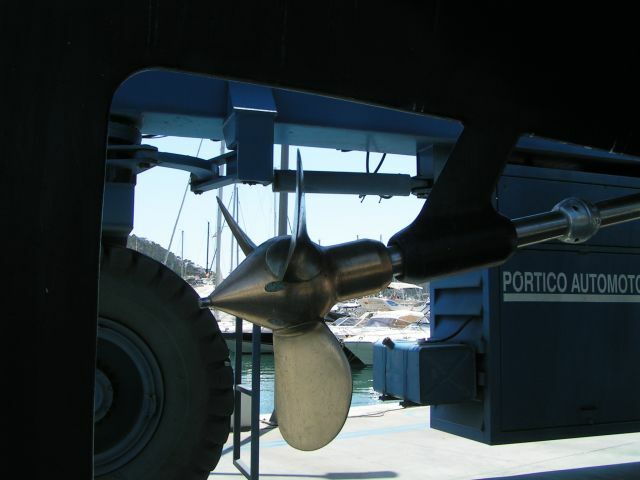 It is located under the forward cabin sole. 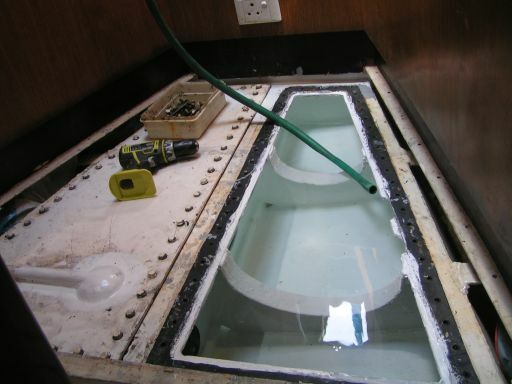 One tank lid on, and full of water for 24 hours for leak testing. 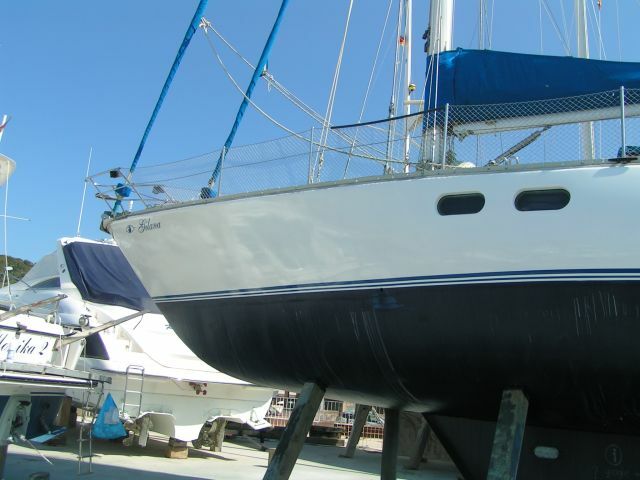 We rubbed down and polished the topsides. We had so many questions from the many tourists wandering along the walkway through the boatyard that we decided to put this on the keel. Prop was polished to ornamental standards. This makes it harder for the critters to get a hold, and makes it easier to clean. 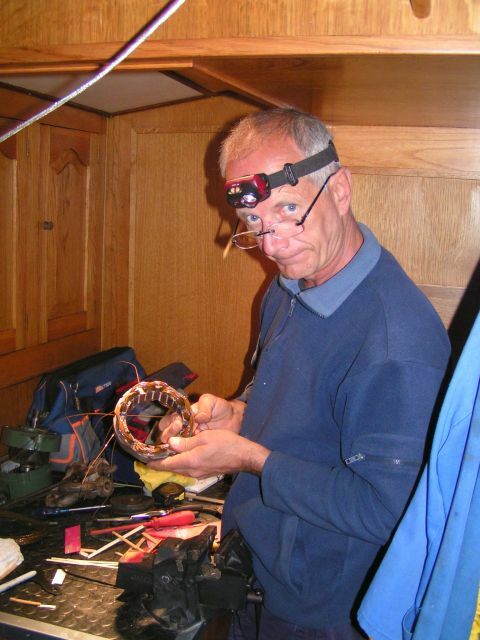 ..and back on to our mooring after 2 weeks on the hard. 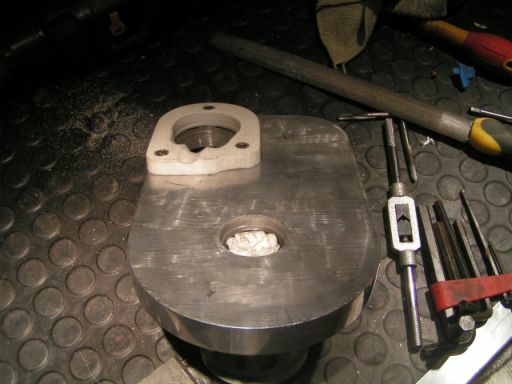 How to separate a big-end journal from a Yamaha 15Hp outboard motor crankshaft without splitting the centre main bearing, requiring a complicated alignment on re-assembly. 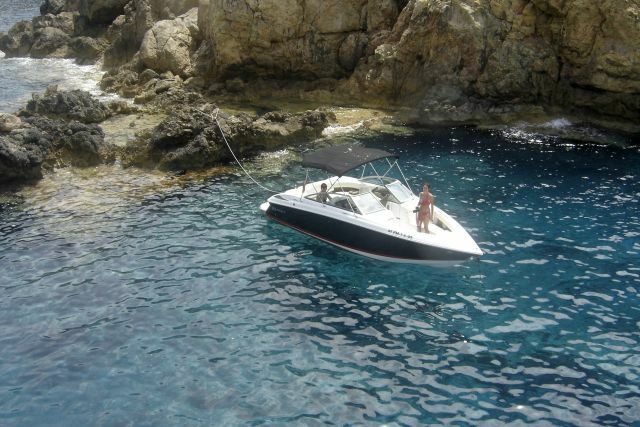 Our friend Aurelio has 7 of these motors running on little boats for rent. 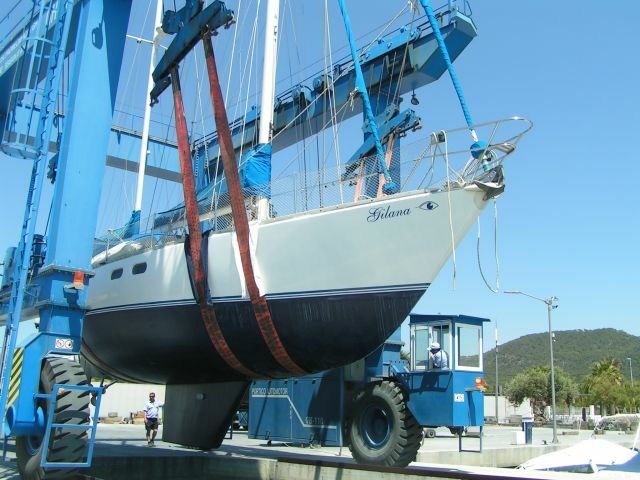 He also has several bigger ones, and I helped him keep all of his boats maintained. The trick is to weld on a large chunk of curved metal, then hang it in a press and push the crank web out off the pin. 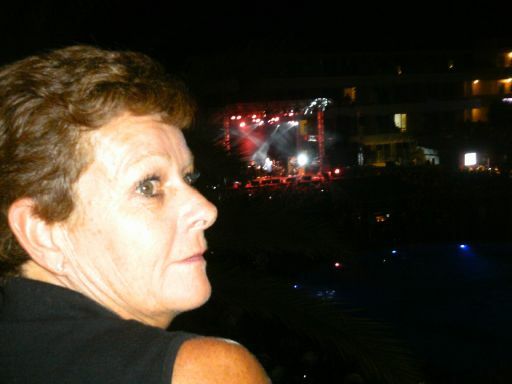 One of the clients who rents boats every year is very good friends with the members of "MADNESS" a British rock group, with hits like "Our House" and "One Step Beyond" We were invited to a gig they played in Mallorca, and spent the evening in their suite with a balcony view of the stage. 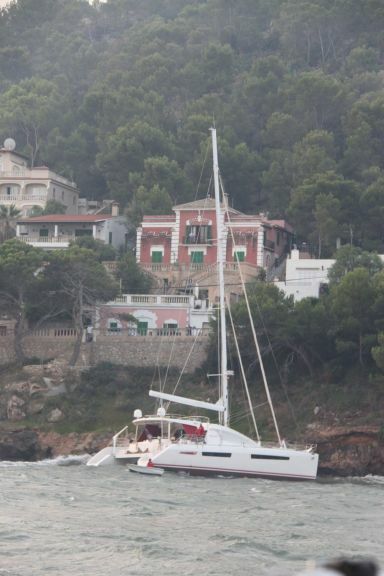 On our way back to Port 'd Andratx after spending a weekend at Cala Ses Ortiges. More friends, Henrik and Dana. 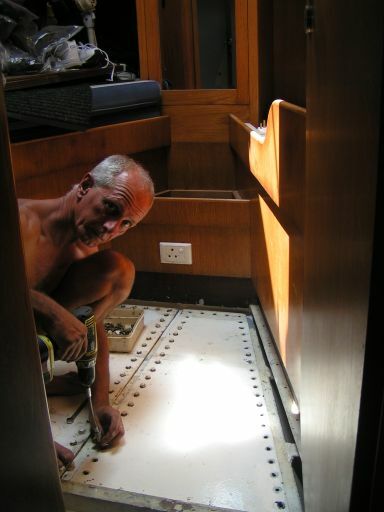 Henrik is one of the best shipwrights I have ever met, the man of invisible joinery. 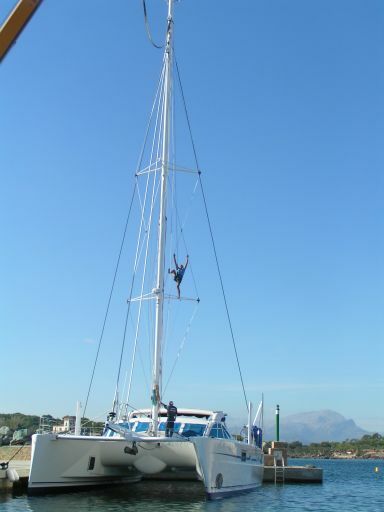 We arrived in Marina de Bonaire to help Leo with his Catana 521 that I had gone to Trinidad in 2010 to commission and motor to Martinique for a new mast. 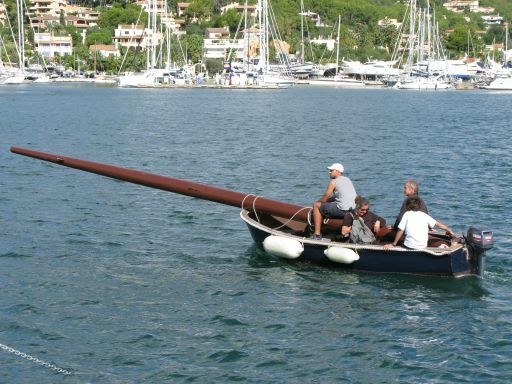 Here the mast is re-stepped in Mallorca after a few modifications. 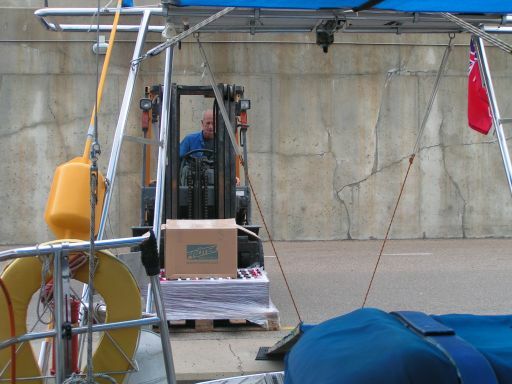 We also renewed all the Trojan T-105+ batteries, with the help of Leo's forklift. 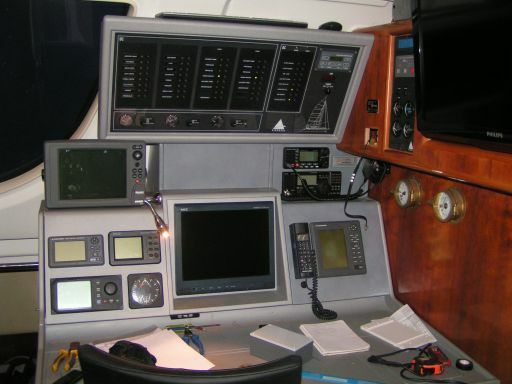 I also remodelled his nav centre, with a new SSB radio, VHF Radio, Pactor modem, Energy monitor etc..
..and created an NMEA data patchbay that makes interconnecting of all the different instruments easier to maintain and re-configure. 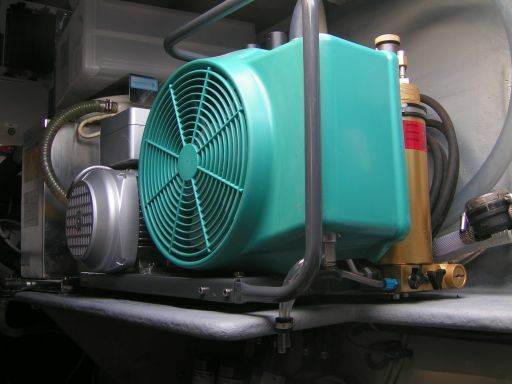 Installed the renovated dive compressor. 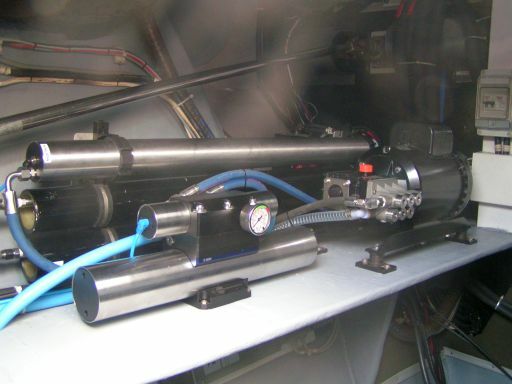 A second watermaker capable of running on the solar panels alone. 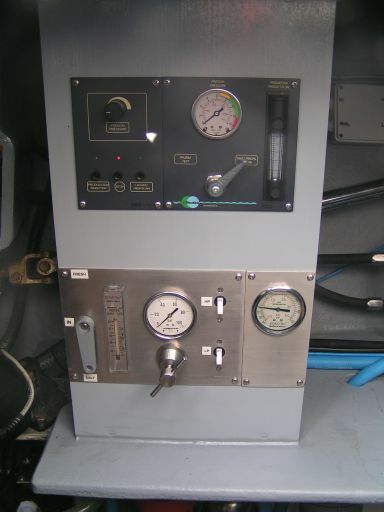 Created a combined watermaker control panel for both watermakers with easy access from the engine bay hatch without entering the engine compartment. 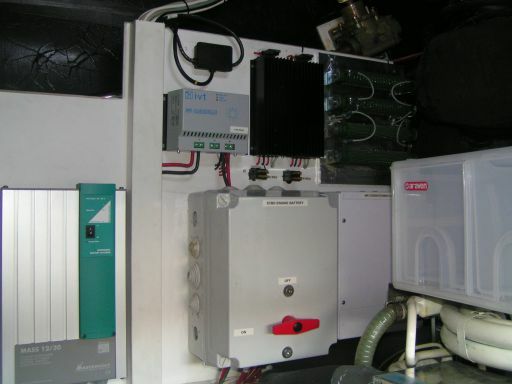 Incidentally the new watermaker is the best I have ever seen, it is an "Eco-Sistems" made in Barcelona. 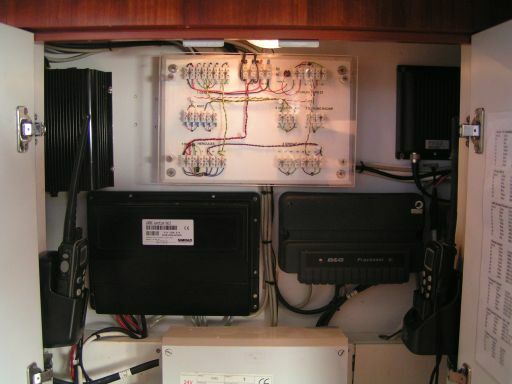 MPPT charge controllers, and wind generator regulators with discrete wiring. 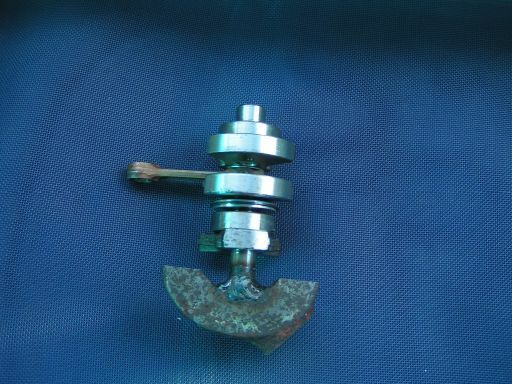 The base plate of Gilana's windlass was corroded and spare parts were not available. 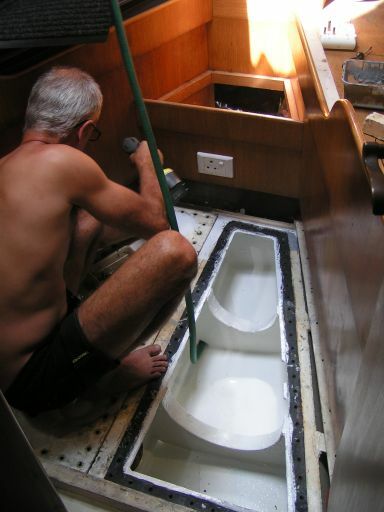 A new windlass required significant cutting of the deck to make it fit. 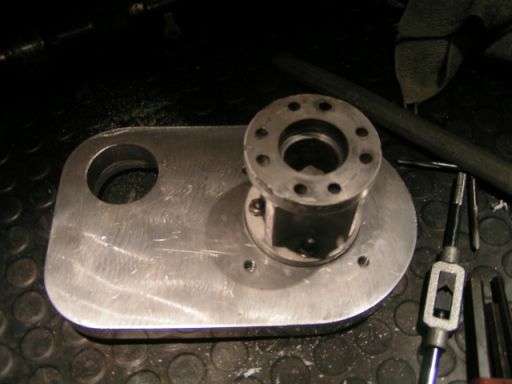 I decided to make a new baseplate instead, and renewed all of the bearings inside the windlass. 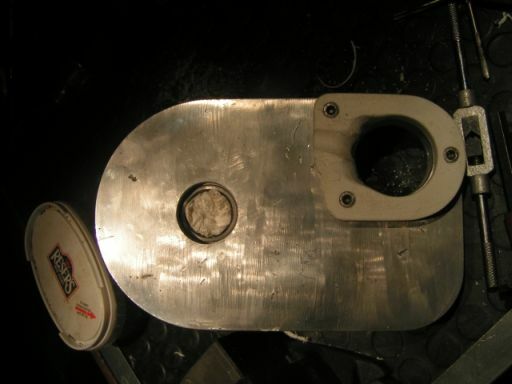 I made a new design of low friction plastic wear plate for the chain to turn down the Spurling Pipe. The original motor mounting fitted. 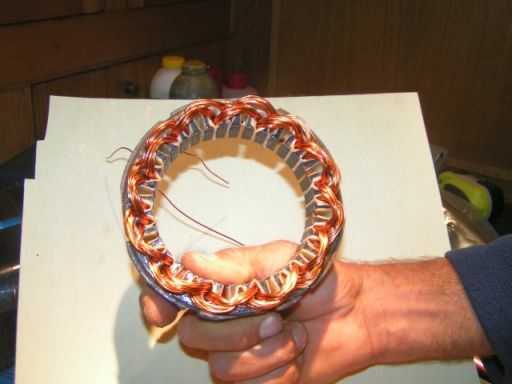 That winter I also tried my hand at re-winding two of our old burnt-out alternators, and fitting them with new "smart" external regulators. After the second of three phases. They are working better than ever before. 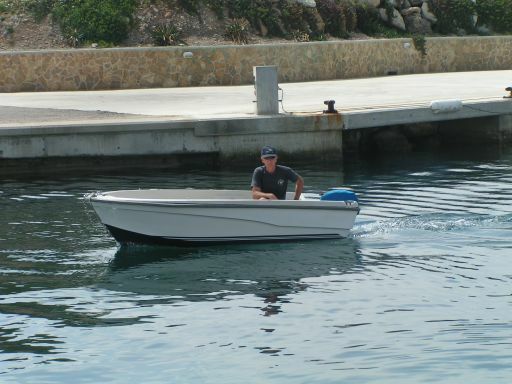 "Tassies" our dinghy got a re-furbish too, and then it was back to Port 'd Andratx again for summer. No sooner arrived than the work started coming in. 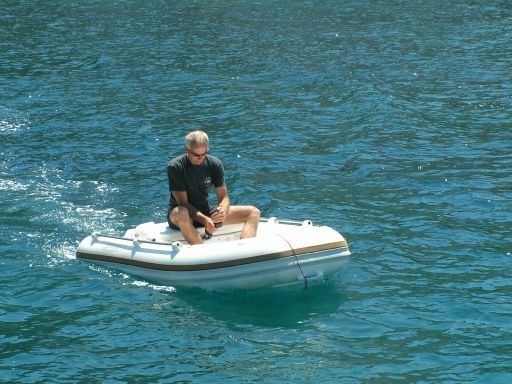 This dinghy is a jet driven, joystick controlled, Vespa scooter engined toy. 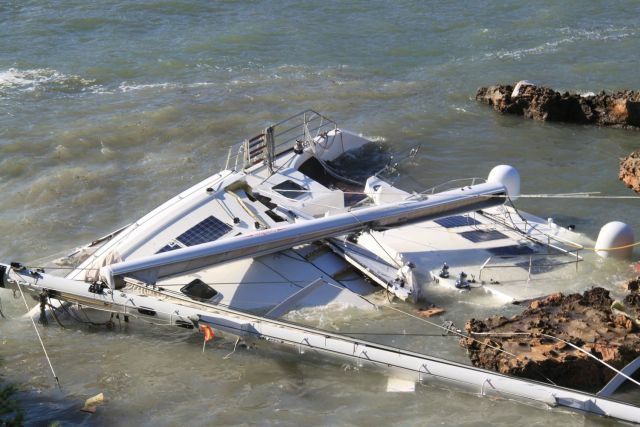 This poor boatowner had just spent his life's savings buying this boat, taking delivery only a week earlier. 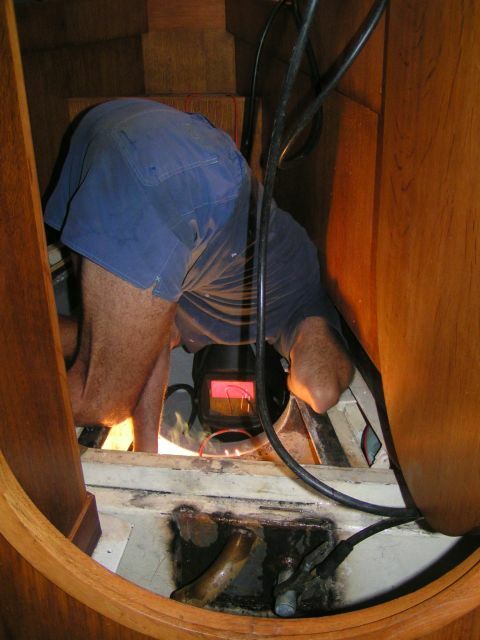 We had helped him learn some basic seamanship, and then this happened. 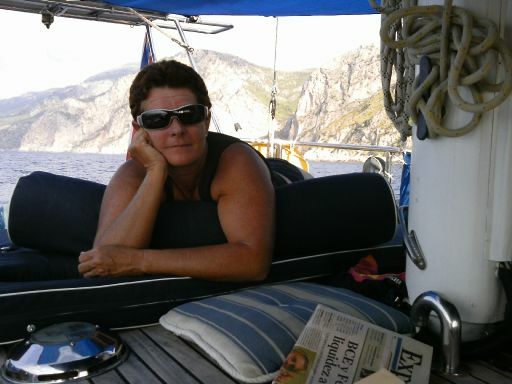 Driving or Skippering boats for Aurelio was a pleasure, Laura and I met some wonderful people and enjoyed some superb anchorages. I also made a chain stopper for Gilana. 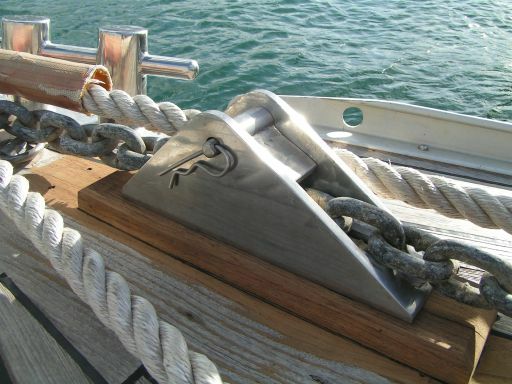 The whole story is on Cruisersforum.com but, in a nutshell it prevents the chain backwinding the windlass under arduous anchor retrieval conditions. Summer 2012 topside polishing and paint repairs in the water, using the sailboard as a platform, while Laura attends to Stainless Steel polishing. Liz came to visit and took this picture of me posing as if to consume a conveyor belt of Chinese food. Coffee with Liz in Andratx town. 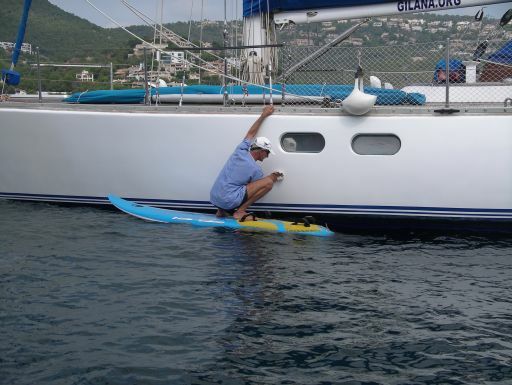 Here Laura and I unsucessfully attempt to save the Catamaran IFALIK a Pirivilege 615 from being wrecked. Unfortunately there were no keys, the boat was locked, and there were no lines available. A few hours later this is all that was left.